I am trying to imagine myself as a 15 year old back at school and trying to make my own decision regarding the Climate Change rally today, planned weeks in advance. How capable would I have been to assess the science on Climate Change? Actually, even now I don't think I can really independently assess the data. I understand that greenhouse gases accumulate in the atmosphere and are associated with higher temperatures. I understand that the world production of Greenhouse Gas Emissions (GGEs) is increasing and that they come from the burning of coal, oil, and wood or anything combustible and are mitigated by the process of photosynthesis performed by trees and in fact all plants including plankton in the sea. Thank you plants and trees! In Melbourne we are reducing our tree cover hand over fist as we build over our gardened suburbs far more densely. We add more GGEs as we add more people, since they all use electricity, they all in one way or another use cars or other transport. They consume goods, the production of which causes GGEs. So I imagine how I would respond to the choice of attending a large rally whose purpose is to send a message to our federal government seemingly thumbing its nose at concern over climate change. In my 15 years would I have noticed any changes personally? I read about melting ice at the poles, I see You-Tube videos of polar bears unable to hunt due to loss off their ice environment. I hear of terrible droughts and fires in Australia often attributed to climate change. My teachers appear to be in favour of students taking half a day off school to attend the rally. What do I do? The popular kids are all attending the rally. If I don't, how will I be seen? What will be the fallout? Whatever I do, will be public as far as my peers are concerned. I have to make a decision and make my first political statement. People are talking about being "on the right side of history." Of course when my own children ask me what I did I will want to be on the right side of history. However, the issue is somewhat intangible, abstract and seems to rely on a leap of faith. I don't want to be called "climate change denier." That sounds very much on the wrong side of history! I need to be a "believer." A bit of self talk is needed. I feel passionately about the natural world and I see assaults on it every day even where I live. Climate change affects the natural world but the science is complex for me, I have to take it on faith and I don't feel comfortable with this. Despite my misgivings and insecurities, I'll have to go today and join my classmates. I'm taking a punt that I am on the "right side of history." My parents do not approve of my attending but have said it is up to me. I'm ambivalent but I am going. I am a schoolteacher, and I am on my way to the Climate Change march. I am also ambivalent. What are the children going to be learning in their 'first political statement' based on righteous indignation and general demands? I'm afraid they are going to be learning their first lesson in their political impotence. Because, as an adult who has tried to stop over-population, over-development and habitat destruction in this city and this country, I know that the government and the press are entirely capable of ignoring indignation on the steps of parliament from multiple residents' action groups. Our schools should not be marching in the city. We should be marching, if we are going to march, to our respective local councils, with carefully thought out lists of demands. First, we should be asking our local councils to make laws against tree removal and habitat destruction. Next on our list would be to ask them to investigate and cost new alternative power options and local food production options. Our schools should then put their science and other teachers to work with the children to examine the logistics and possibilities of these new technologies in the field - locally. What better place for us to learn to be effective, and to engage politically on energy and production than in our own communities and biophysical environments? This would also open up local careers in alternative industry avenues in energy and resources and planning. Youth suicide rates would drop, since political engagement close to home is an antidote to feeling worthless and powerless. How might we notify the community of our serious intent on these matters? School children should be turning up, with their teachers, to every attempt to remove a tree in their local community and stop it until it is carefully evaluated. Perhaps we could form tree councils with others in our localities in order to promote alternatives to moonscaping our neighbourhoods. How long, I wonder, would it take before we all realised that there should be local limits to growth? That would put a spanner in the authoritarian regime of planning for population growth and development. Thereby, by combining local action all over the country, we would accomplish far more than any Paris climate change conference. I guess that is why we are all marching instead. Great response from the teacher. I would add that there needs to be an awareness of how much the livestock industry adds to GHG (over 51%) and an implementation of intent to act in the form of adopting a plant-based diet. Also none of these environmental groups talk about how critically important the ocean is in regulating our weather (by uptaking 50% Co2 of our atmosphere and producing 70-80% of our oxygen - far more than trees produce). So why aren't the environmental groups talking about diet? Instead they sit around at meetings eating dairy (at the very least) and fish, hypocritically spouting on about what to do. Yes we need to protect every tree, yes we need to stop coal mines, yes we definitely need to limit population and immigration. But no political party dares to talk about the impact of chemtrails on our weather. Why not? Are we totally asleep at the wheel? If these children marching for the climate read my book 'Arktel, the Planet Only Children Could Change' they would get more practical ideas of how they can make a better future for themselves and why it's up to them. I sincerely hope they do. He argues that all the problems that today's student marchers wanted our state and federal governments to fix, could, instead, be fixed by local governments, schools, teachers and local communities. Whilst, of course, we cannot hope to fix the environment without action by individuals, grass roots action and local councils, no amount of work on this front can hope to overcome the effects of state and federal governments acting to serve the interests of corporations against the interests of ordinary people and the environment. In particular, how can just local governments and local grassroots action hope to counteract the effects of high immigration encouraged by our state governments and our federal government? Furthermore, how can only such local grass-roots action hope to stop our Federal Government from siding with the U.S. Empire against the people of Venezuela, Syria, Palestine, Lebanon, Afghanistan, Iraq and Yemen and the even worse environmental destruction, not to mention human suffering, that that has caused? Whilst we still live in a formal democracy, can vote and even stand for office, I think it is still possible to hold to account at election time those politicians who have served us so poorly. If done effectively, a good many, who had previously voted for them will be looking for other candidates to vote for. Of all other candidates other candidates seeking our vote, they must be must be asked what they plan to do for the environment if they win office. In this way the profile of such candidates could be raised to the point where they should gain, at the very least, a good first preference vote. With effective grass-roots political campaigning we should even be able to hope to get such candidates elected to parliament. The profile of such standing members of parliament would certainly make the local grass-roots action advocated above more effective. From this we can hope to move forward to them being able to form governments that properly represent us. If this seems overly ambitious, this has already happened on at least two past occasions in Australia : the Federal Labor Government of Gough Whitlam from 1972 until 1975 and the South Australian State Labor Governemnt of Don Dunstan from 1970 until 1979. If it has already happened in Australia, why can't we hope again to get such governments elected to power, but, next time, make sure that they remain in office? But, again, I don't see how we can hope to achieve this though just grass-roots action at the local level. Thank you for your comment. The article was written by two different people who wish to remain anonymous. It was wrong to imply that state and national marches are useless, but without follow-up, they are not much use. Currently governments at all levels and most of the population are technologically and scientifically too incompetent on the subjects of energy and material resources to deal with the problems they raise. Here's how local action could work at the national level. Councils and individual citizens, even residents' groups, have little power to influence the state through traditional methods of protest, voting or media attention. However school populations could have the numbers and enthusiasm, communication and cohesion, to submit demands directly to councils and apply pressure, which would then have to submit these, in one form or another, to state and federal governments. If many schools approached many councils, this would constitute a national movement, which could be reinforced by student media. 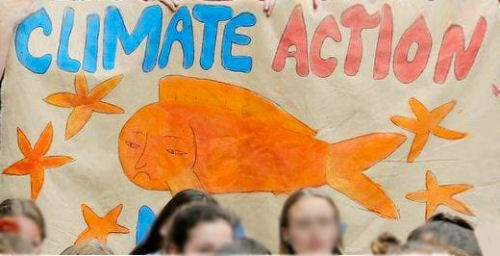 One assumes continuing international promotion of climate change mitigation as an imperative and therefore that school children, who feel that their entire futures are imperilled, would not back down, and would have to learn a lot about technology until they became experts and innovators in subjects like energy and material resources, logistics and capacity, with associated skills of leadership, administration and organisation. Such a social transformation would tend to make the rest of the community more informed, including the council and state and federal political actors, who currently feed us motherhood statements. Student demands would presumably mostly also start off as motherhood statements, but climate change mitigation is a movement that seems capable of binding much of our youth and their mentors, to a point where it may not be possible to distract or dumb them all down. The traditional voting system, given a more informed scientific base in the population and among politicians, might offer more solutions and recognition of problems than it does now. A school student movement also has the cachet of youth and the ability to lead trends in values, which adult institutions will be influenced by for fear of irrelevance. Ultimately new expertise in school populations could lead to new local economies and education systems and political engagement currently not even imagined in our local communities, or our local councils, or our state and national governments, or our mass media. With regard to Whitlam and Dunstan in the 1970s, the establishment political and corporate machine now controls the media and the curriculum. The community has been infilled by population and development growth, made passive by the mass media and its promotion of authority figures, and divided by identity politics. In my opinion, only a widely perceived crisis can unite against the manufactured consent. It so happens that school children, normally expected to passively absorb data, have been mobilised world-wide about climate change mitigation, which requires enormous technical and scientific knowledge, for which curiosity and action are required, rather than passivity. ADDITION: I just realised that I failed to respond to James Sinnamon's question as to how bad international politics of supporting interventions or wars on Venezuela, Syria, Palestine, Lebanon, Afghanistan, Iraq and Yemen. If you are ignorant of the concepts of thermodynamics and energy and material resources and the history of their acquisition and exploitation through war and slavery, then you won't be able to related our support for criminal interventions. If, however, you become engaged in finding alternative energy resources for practical needs in your local environment, you then have to ask questions about where energy and materials were sourced previously. If for instance, you want to produce solar panels, you will be confronted with the need to mine metals, and then with the need to provide energy for machines to do the mining and transport and processing and production of the final product. I think that much of the current Australian population has a big problem of induced passivity, which prevents it from inquiring and drawing its own conclusions on problems, due to a learned idea that only 'authorities' can work these things out. When it is given ridiculous accounts of our government's motivations for supporting wars, it assume that it is just too dumb to understand, rather than considering that the corporate media is handing out nonsensical explanations, which should be countered in a new media. Every time I look at Q&A, or attend a public rally, I see the same ridiculous format, where the 'audience' may only listen then ask 'questions' of the 'expert' speakers or panel. Yet very often the 'experts' are not really expert, and many of the participants, deemed audiences, have more expertise. What are our kids being told at school ? This afternoon I visited friends visiting Melbourne from Tasmania to look after grandchildren during the school holidays. Towards the end of my visit I mentioned that I had heard of the University of Tasmania buying buildings in the Hobart CBD for student accommodation. "Oh yes" they said, "The uni has bought a large hardware store and motels for this purpose." Stuart (the grandfather) remarked that it was a pity as the University in Sandy Bay set in its beautiful grounds was a great place of learning. I asked what they are doing with grounds. He said "Oh, they're keeping most of them for sports grounds but some are being turned over to accommodation." I told them what I thought - that the place was being ruined for overseas students. Jen (the grandmother) said, "We can't express an opinion on this or similar matters to or in front of our grandchildren (in Tasmania) because they are taught something else at school. We might say something and they will say -'you are wrong!'" Stuart added "but we know we are right!" Jen said that they can't go any further with particular discussions because they would contradict something they have learned to believe at school. This just horrifies me - it creates a gulf between grandchildren and grandparents because the children are taught things as doctrine - that is clear. Discussion is obviously discouraged. I say this because, to say someone is "wrong" creates a dead end in a discussion. What a way to teach children! Discussion of issues with grandparents is valuable especially in a time of rapid change as is being thrust on Tasmanians. If teachers are teaching dogma as I suspect they are, they need to stop and question what they are doing, whether it is under orders or not. I am particularly concerned about this brief report as this couple, the grandparents, are not the protesting kind. They are fairly docile people who do not generally make waves or look for trouble. This would not be an isolated situation. It's probably repeated many thousand-fold all over Australia. I have a terrible sense of brain washing.